VOM announces new Christian school initiative. When Christian families were forced out of their homes in northern Iraq by the Islamic extremists known as ISIS, they had to leave everything behind. Many of the families fled to other areas of Iraq and the neighboring countries of Turkey, Lebanon and Jordan. They have escaped immediate danger, but they are still living near the ISIS frontlines. These families are living in shelters, warehouses, and vacated apartments. The parents cannot work to provide for their children, and the children have no schools to attend. 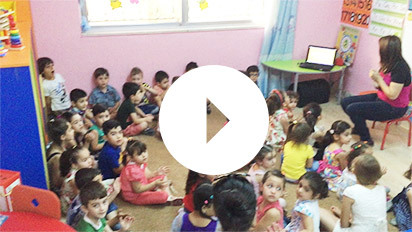 Partnering with local Christian leaders, VOM is working to launch a new Christian elementary school for children who have suffered at the hands of ISIS. These Christian families gave up everything when they were forced to flee their homes in the Nineveh Plain in northern Iraq after refusing to deny their faith. This outreach includes renovations, school supplies, teachers and even vehicles to transport the children. The school will soon be filled with more than 150 children, ages 4 through 8. We pray that the Lord will use us to provide them with a quality Christian education. In support of this opportunity to bless our persecuted family, VOM is committing to raise $150,000. This will ensure support for more than 150 children of the displaced Christians through the 2015/2016 school year. We invite you to join with us in serving these precious children. HELP LAUNCH THE CHRISTIAN SCHOOL BY CLICKING HERE! Any amount is great appreciated and will go a long way to realizing this goal and helping the VOM. Nov. 1, 2015, is the International Day of Prayer for the Persecuted Church. Nov. 1, 2015, is the International Day of Prayer for the Persecuted Church. Our partner is Christ is offering a variety of free resources to support this day. Please check them out here: http://www.persecution.com/idop or here.